To build an Interactive classroom that will adapt to your needs for years to come, you must begin with a solid foundation. The ActivBoard 100 is a 78" classroom-tough Interactive display that integrates seamlessly with included ActivInspire Personal Edition software. Designed to withstand the toughest of classroom environments, the ActivBoard 100 encourages active participation and collaboration. With a click of the ActivPen, leverage ActivInspire Personal Edition's Resources, templates and activities to take students on a captivating field trip with Interactive lessons brought to life with colour and movement. Promethean Planet's 50,000+ free teacher Resources and online Professional Development offer everything you need to create more active, inspired and engaged classrooms. With enhancements like stereo sound, wireless connectivity and Dual-User functionality available as simple upgrades, ActivBoard 100 is scalable and adaptable, providing a solid foundation to build an Interactive classroom at your own pace. 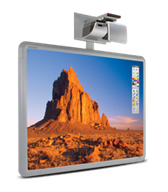 The ActivBoard 100 is available as a Mount System with a choice of Short Throw or Extreme Short Throw Projector.